If you are a business owner or a marketer, you know how hectic the work days can get. Back-to-back meetings, ensuring the team is on track to meet their monthly marketing goals, double checking the social media activities which goes live in the next 30 minutes and the list goes on... It can be an excruciating task to balance everything you need to do while also making sure that your marketing is reaching the right audience, at the right time, with the personalized message, to successfully generate new leads. Thatâ&#x20AC;&#x2122;s where marketing automation comes to play. How Marketing Automation helps a business? 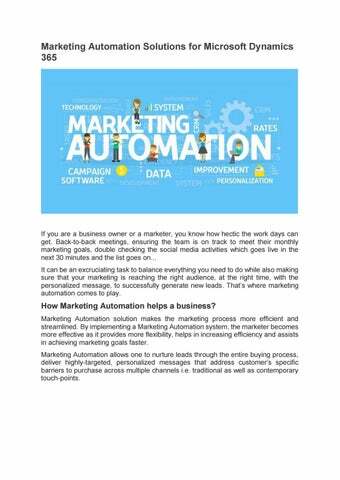 Marketing Automation solution makes the marketing process more efficient and streamlined. By implementing a Marketing Automation system, the marketer becomes more effective as it provides more flexibility, helps in increasing efficiency and assists in achieving marketing goals faster. Marketing Automation allows one to nurture leads through the entire buying process, deliver highly-targeted, personalized messages that address customerâ&#x20AC;&#x2122;s specific barriers to purchase across multiple channels i.e. traditional as well as contemporary touch-points. Know what research is saying about Marketing Automation According to industry reports Marketing Automation software industry is estimated to reach $7.63 billion by 2025. Marketing Automation and CRM. How this combination can do wonders to your overall marketing? The key challenge that most of the marketing heads across the globe experience is how to increase the ROI on the marketing initiatives by leveraging Marketing Automation solutions. There is a plethora of solutions available across the globe ranging from point solutions to the ones offering multi-media marketing capabilities for SMEs as well as large enterprises. Some of these marketing solutions work independently but can be integrated with other applications and some are available as part of the CRM offerings. It is advisable to use a Marketing Automation solution in conjunction with CRM so that it can be used throughout the customer lifecycle to monitor ROI. Dynamics 365 CRM and its integration with third-party add-ons Specifically talking about D365 CRM platform, there are a lot of Marketing Automation solution options available in order to cater to various customer segments. These include third-party point solution add-ons, Click Dimensions, D365 for Marketing, and Adobe Marketing which are all seamlessly integrated with D365 CRM platform. They offer various capabilities for one to choose from. Third party point solution add-on like Mail chimp is primarily meant for e-mail marketing, provides the capability to configure and execute e-mail campaigns and offers decent reporting capabilities. It offers the ability to track bulk email statistics directly within to individual CRM contacts, leads and accounts in CRM. It also offers a template editor for designing emails. It has rich features focusing on B2B marketing and empowers one to tap into LinkedIn's business prospects. It provides capabilities w.r.t lead generation, scoring, prioritizing and qualifying leads for sales. What benefits you can achieve from D365 CRM for Marketing? The objective of all these capabilities is to drive traffic to the website, convert that traffic into leads and close those leads into customers. The lead scoring model helps in defining lead conversion parameters in Dynamics 365 and managing them effectively. D365 for marketing is available on D365 CRM cloud offering at present. It can be used independently as well as along with other D365 CRM offerings. Click Dimension Add-on Click Dimensions application add-on also offers competitive capabilities on all the aforesaid aspects and is available on the cloud, though can be integrated with D365 CRM on-premises as well as online. Click Dimensions has been into this space for around a decade now, the product is relatively mature/rich and has a proven track record with several successful implementations. So if one is using on-premises or a partner-hosted dynamics environment or is on a legacy version of Dynamics CRM then Click Dimensions will be a better fit. Click Dimensions has an edge over D365 for Marketing when it comes to support over various Social media platforms, web site tracking capabilities whereas D365 for Marketing scores well when it comes to lead scoring, integration with LinkedIn and richer segmentation using customer insights data. Adobe Marketing Add-on On the other end of the spectrum is Adobe marketing cloud which offers very rich multi-media marketing capabilities and is primarily targeted towards enterprise segment with a focus on B2C where the monthly e-mail volume is of the order of 500k to 1 million or so. It provides real-time interaction management capabilities to make real-time offers to customers. It definitely has an edge over other aforesaid offerings in terms of its ability to engage with customers over mobile applications, instant messaging and social media platforms. It also offers flexibility in terms of deployment options â&#x20AC;&#x201C; on-premises, online and hybrid. 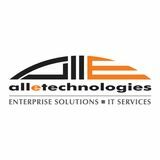 Middle-East, the company has helped companies across various industries in their Implementation and upgradation of Microsoft products.